Book Review: Trail of Steel: 1441 A.D. 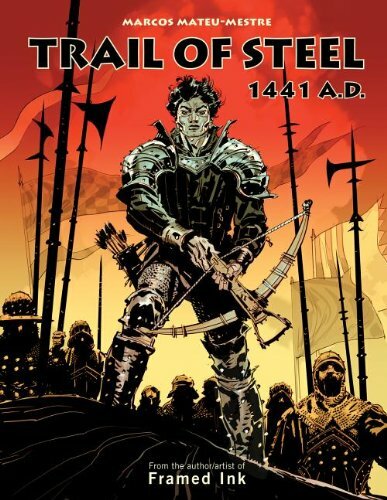 Trail of Steel: 1441 A.D. is the graphic novel by Marcos Mateu Mestre. His previous book Framed Ink covers storytelling in graphic form. This graphic novel uses the techniques he has taught. The story happens in the winter of 1441 A.D. in Spain. A father and his son are on a mission to find some people who pissed off the lady. The tale unfolds in a cinematic and dramatic manner. Art is amazing. It's in black and white but with the masterful composition, it really gets you close to the action. Characters are carefully placed, directed, and every panel is like a study of tonal value. This book is a good example how powerful composition can be used for storytelling. At the end of the book are some sketches and his thoughts on the story. Highly recommended. And definitely check out Framed Ink if you haven't. The book is available in paperback and hardcover.